That is glittery and spectacular!!! Love the sequins on the wreath. And yours looks like a little stitched winter wonder, love that snowman with that PTI tag you chose! These are beautiful!! I loveeeeeeeeeee the snowman and the wreath!!!!!!! More awesome tags! Love both of them. I love the wreath and the snowman! Love the snowman and his stitched scarf. You know how much I love that snowman! Gayatri's wreath tag is beautiful! LOVE your soft, stitched, sweet, and simple snowman. I already follow you by Google Friend. Yippee!!! I love the red scarf on your snowman...red, white and kraft...great combination. That is neat twine too...I am going to have to have some of that! They have all been great but I love this snowman with his scarf. Great tags! Glittery and gorgeous, followed by simply splendid snowman-y smile-making! 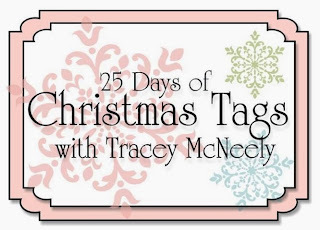 Another round of delicious tags and wonderful inspiration! Thank you, again, for the gallery of tags you're sharing with us! Ooooh more tag loveliness!! I adore the white snowman on the kraft tag with a touch of red! So cute! Two beautiful tags. Yours is so cute too! Beautiful tags! Love the glitter. Love that cute little snowman too! I love both tags! Glittery goodness from Gayatri and stitched goodness from you, Tracey! Fun! Your tag just proves that simple can be beautiful, or cute. Great, however you describe it. Gaytri's is sparkle city and I love the punched wreath. I love that you kept your tag CAS...Kraft with white and red is so classic and so pretty! 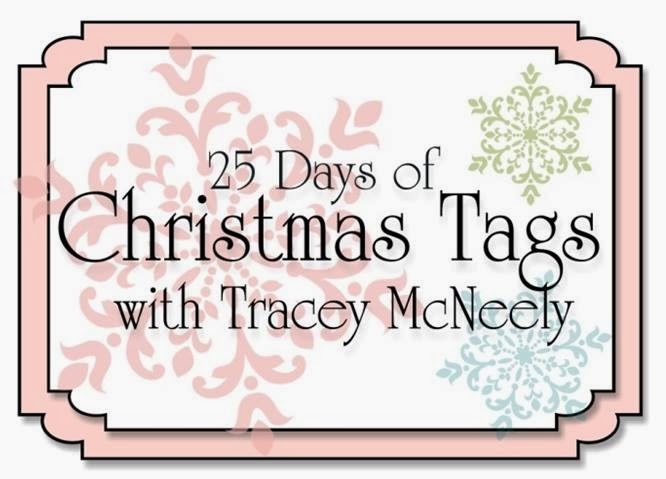 I love the stitched elements, too...so charming, Tracey! More fabulous cards! 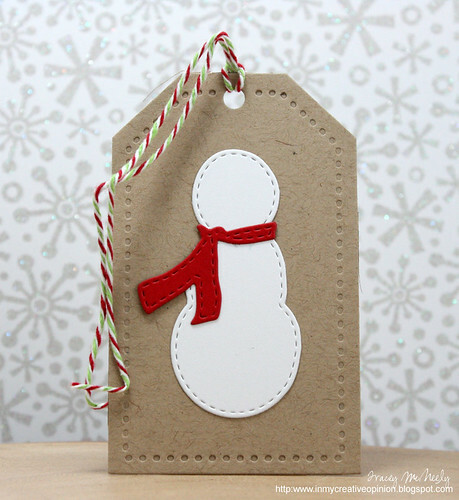 I am loving the stitched look with that snowman tag. Adorable! Fabulous tags today! Love the wreath and the snowman! Another 2 great tags! Love all the sparkle in the first one & your snowman is darling! Wow, the glitter & sequin berries look awesome! And your snowman is adorable--so perfect with the stitching on the tag too! I am already a follower. Your tags are beautiful. The little wreath is stunning. So much detail. I follow you via email. I follow your Pinterest boards which always inspire me. THank you. Sweet tag Tracey and I have these dies too...it is just adorable.! So is Gayatri's tag, so festive. Love the glitter!! Love the snowman! !